Hard to believe it’s time for another foodie penpals reveal day already! 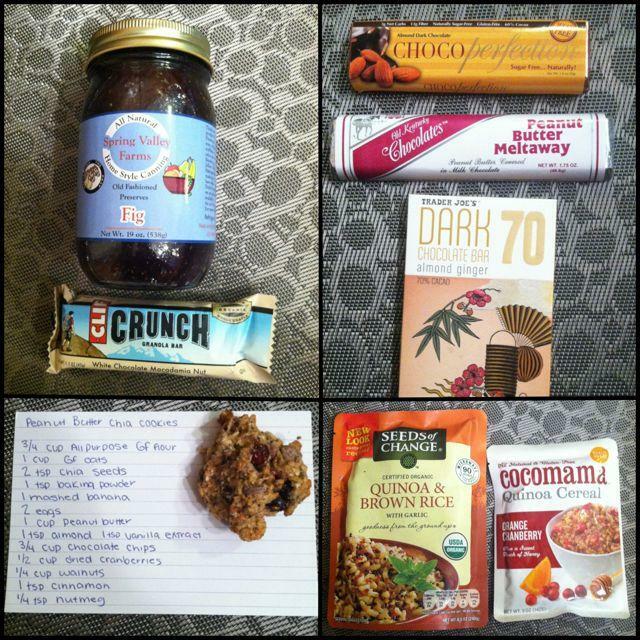 This month I received my box from the lovely Nicole and Fruit ‘N Fitness! Nicole and I have been chatting a lot recently on Twitter so I was excited to see I’d be getting a box from her! Fig jam that is AMAZING! A flavor of Clif bar I haven’t tried yet! All sorts of delicious chocolate- the dark chocolate almond ginger is SO GOOD! Homemade cookies + a recipe – they were delicious and didn’t last very long in my house! Cocomama quinoa cereal- I wasn’t sure I would like it, but it’s really tasty! Thank you so much Nicole for all the goodies! You’re the best. If you’re from the US or Canada and are interested in participating for May, please CLICK HERE to fill out the participation form and read the terms and conditions. *If you’re from Europe, please CLICK HERE to signup. that quinoa and brown rice packet is so good! i saute onions and cherry tomatoes and add a little Parmesan cheese and a bunch of vegetables and then add that packet – so good!! I am away but my box is waiting for me at home! I will post my blog post about it when I get back on 10 May. Sorry to be late!! What a great package! I havent had cliff bars in forever! Ive had that flavor and it is one of my favorites! 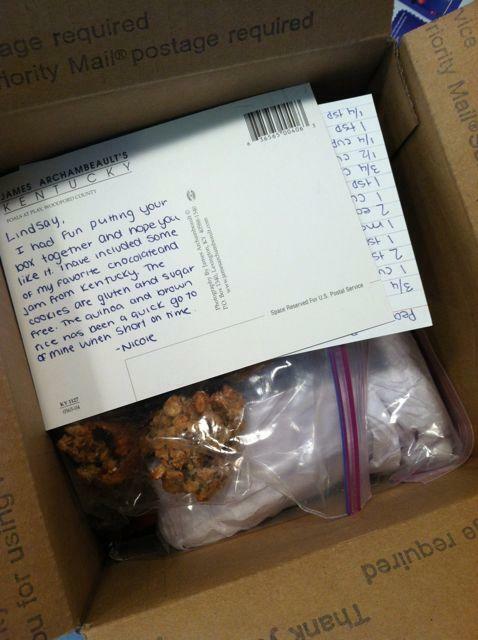 I need to sign up for foodie penpals again! Im so busy in May but maybe In June Ill do it again! we’d love to have you any month! Awesome package! What flavor of CocoaMama cereal did you get? I received the banana cinnamon in a package once and it was a tad off-putting, but I’d be willing to give the others a try, too! Thanks for hosting another fun month of foodie penpals! I’m glad you liked some of the items in the box! I love their jams, I always look forward to seeing that farm at the farmers market! I think I’m going to steal that cookie recipe! Looks good! I must say, the top right photo in the collage is what caught my eye. 😉 I’ll have to look for that Dark Chocolate Almond Ginger Bar at my TJ’s – it sounds awesome! it’s good! my mom loved it too! I have no idea what I did wrong but I was not able to post about my box. you weren’t able to link up? or post on your blog? I wish we had this foodie penpal thing in Australia. we’ve tried it there a few times. there’s just not enough consistent interest! I marvel at how you organize the coolest, most wonderful group events. God I love you… and the fig jam looks amaze balls. had it for breakfast today. deeelish! I loved my package from my Foodie Penpal! What a wonderful package 🙂 so fun! [WORDPRESS HASHCASH] The comment’s server IP (174.120.80.130) doesn’t match the comment’s URL host IP (174.120.80.158) and so is spam. [WORDPRESS HASHCASH] The comment’s server IP (94.136.40.100) doesn’t match the comment’s URL host IP (94.136.40.103) and so is spam. [WORDPRESS HASHCASH] The comment’s server IP (66.135.48.191) doesn’t match the comment’s URL host IP (76.74.254.120) and so is spam. [WORDPRESS HASHCASH] The comment’s server IP (66.155.8.237) doesn’t match the comment’s URL host IP (72.233.69.6) and so is spam. [WORDPRESS HASHCASH] The comment’s server IP (184.168.193.178) doesn’t match the comment’s URL host IP (184.168.137.128) and so is spam. [WORDPRESS HASHCASH] The comment’s server IP (72.232.113.14) doesn’t match the comment’s URL host IP (66.155.9.238) and so is spam.